I’ve been acquainted with ต เต่า for quite a while now. There was a time, though I can’t quite remember when, it was just another one of those barely noticed stages in the process by which my Thai has slowly, incrementally, been becoming more like “real” Thai — a time when it was dawning on me that the initial sound in words like ต้อง and ต้อนนี wasn’t what I had thought it was, wasn’t really the same as the initial sound in, say, the word เด็ก. If you were to compare across languages, you could say even less like English d than I had previously assumed. It’s a sound that English lacks, and actually articulating ต was more difficult than sounds like น or ม — but still, hardly Thai’s biggest phonetic challenge. I’ve gotten better too, in that I’ve learned to pronounce the sound in an easier, more relaxed way — like a lot of Thai sounds that I have trouble with (errr…maybe that would be, like, pretty much all of them? ), I tended to tense my mouth muscles up and strain every time I needed to get out ต…ต, to the point where conversation partners would remark upon it and advise me to relax, which I’m now able to do to a greater extent. But I think there’s another side to it other than simply the mouth-mechanics of producing an unfamiliar sound. I’m not totally comfortable with a lightly produced ต; I tend to want to exaggerate the ต-ness of it and produce a sound that’s totally, obviously distinct from ท and ด — the two sounds which seem to me closest to ต, and which also seem pretty close to their English counterparts t and d (and weren’t these the sounds that I originally failed to differentiate ต from?). In other words, I still have some kind of anxiety — if that’s not too strong a word — that I’ll produce a ต sound that will be indestinguishable from it’s phonetic neighbors. And then the way that I end up going for a very distinct ต is to use a lot of force in the articulation. I think this has more to do with my perceptions of ต than my ability to produce it. I’ve sometimes articulated a perfectly fine, non-exaggerated ต sound and then hesitated and looked quizzically at my conversation partner and then reproduced the sound in a more exaggerated fashion, only to be told that I had gotten it right the first time. If I’m getting tired or for some reason being sloppy, even though I know it should be ต เต่า, sometimes ด เด็ก comes out. It’s possible that ต เต่า is easier for me to pronounce in combination with some sounds than with others (more on this below). ร เรือ is pretty different from English r (which is how it’s often transliterated). I can do a “one tongue tap” ร pretty well, but really trilling or rolling it is still beyond me — though I’ve had some limited success lately with something that’s like the very beginning of a short, weak-sounding trill. Well, I never got the hang of rolling my rs in Spanish either, and also Thais don’t usually roll their ร unless they’re trying to sound really formal or speak crisply and all เพราะ — or maybe just having some fun. Still, I’d like to be able to roll my ร เรือ someday. Sometimes lately I find myself playing with these problematic sounds, ต and ร. 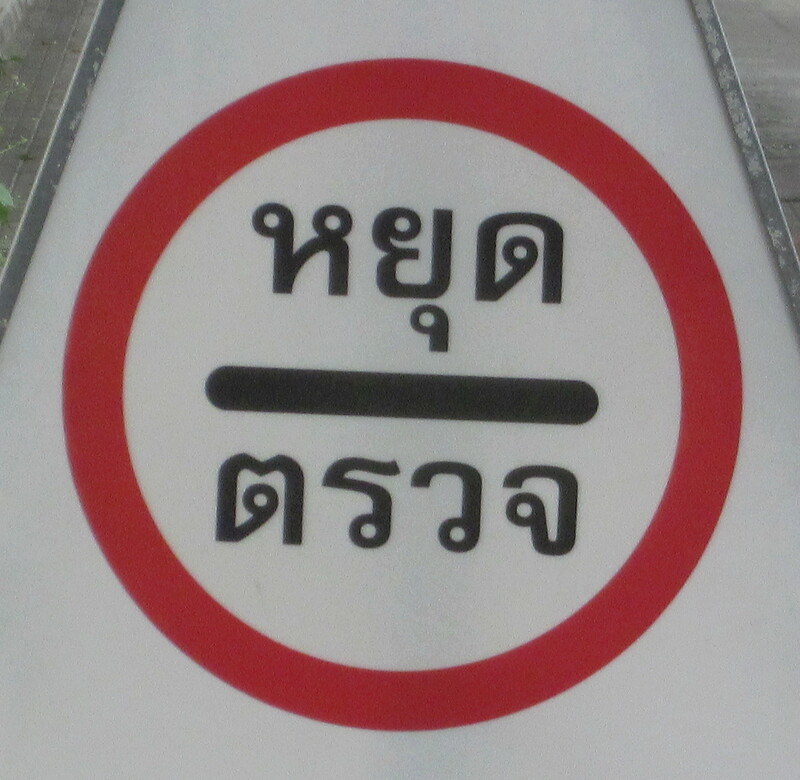 Usually it’s when I’m walking around Bangkok, I’ll say ต or ร to myself — usually not in connection with any particular word — and keep going with it, trying to get the ต to sound sufficiently ต-ish without tensing up and expending unnecessary effort, or trying to get a sustained ร-roll going. When another passerby gets within a few meters of me I’ll fall silent and then start up again after they’re gone, knowing that the continuous street noise will hide my efforts from all who aren’t within a two-to-three armspans’ distance from me. But then there’s ต and ร together, the ตร sound. Like, what the hell! Compared to English, Thai has such a limited ability to stack consonants in succession, and the people I do language exchange with regularly trip over English’s two and three consonant combinations — words like rest, crisp, pants, around, or even the humble and can present major challenges to them, and their pronunciation frequently simplifies things by dropping one (or more) of the consonants. So given all that it seems particularly perverse — kind of funny, actually — that the Thai language has managed to come up with a sound like ตร, which I literally can’t wrap my tongue around. ตร…ตร…ตร…I think my efforts must sound like a motor straining then stalling out with a sputter. Somehow when I say it, the ต ends up sounding compromised, my ร sounds really clumsy too — something about starting off from ต ends up killing the ร, and forget about any possiblity of getting it rolling — and the combination as a whole just sounds, well, not so hot. Anxiety is never too strong a word! Crisp, crisp. I really enjoyed reading this post, and although you struggle with some of the fine aspects of pronunciation (don’t we all?) it is great to see you are feeling more at home with the language.